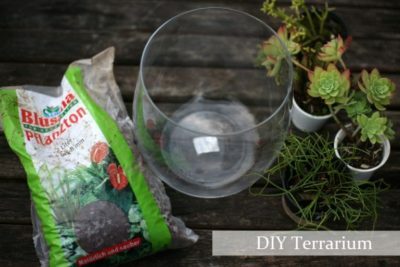 I always wanted to make a Terrarium. So the holiday season was a perfect opportunity to test my skills. 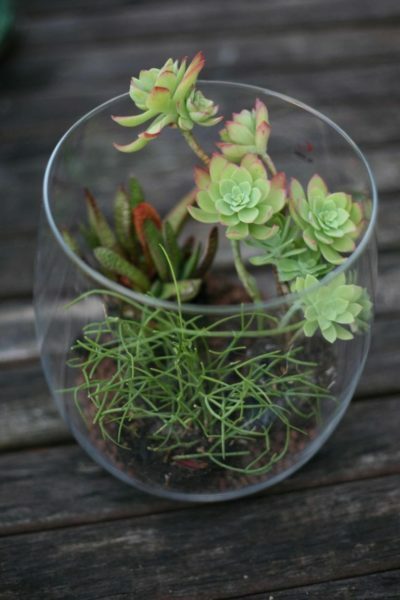 The trend of DIY Terrariums is on for a while now. You can see tons of them at florists at the moment but why don’t make one on your own? It’s pretty simple, honestly, and looks super professional. 🙂 Also there’s nothing better than a personalized DIY gift, right? 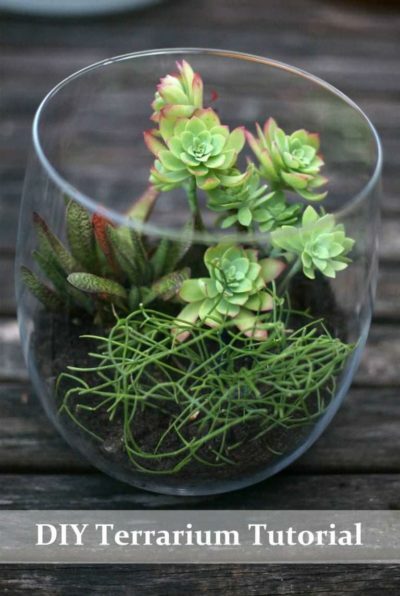 Tipp: Keep succulents and cacti together and keep fern and tropical plants together. They need a different amounts of water and soil. 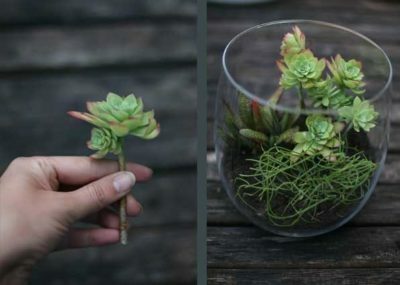 Imagine how you want to arrange your plants inside the vase. Maybe test it out see how well they will fit. 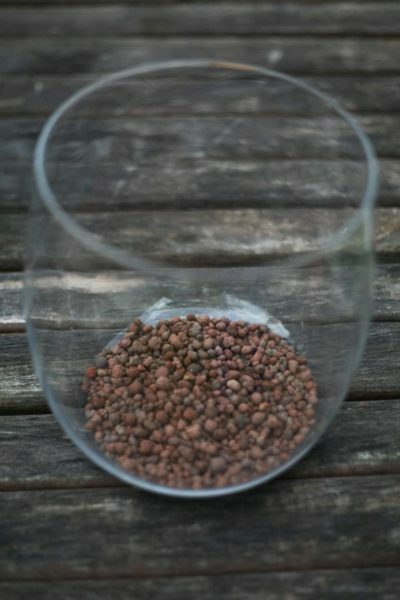 Fill your vase wit the clay pieces until you can’t see the bottom anymore.This is to create a false drainage layer so water can settle and not flood the plants. Arrange the plants the way you like them best. If they’re too long don’t worry you can just cut of a pieces and stick it in the soil. That’s the great thing about succulents. It wil just get roots and grow back! Remember to keep your plants away from the edges or they might not have enough room to grow. Carefully add soil. If some of it lands on your plants just brush it of with a paintbrush. Add as much as you need to cover the roots. I also cut of one of the branches of my succulent that stuck out too much and just stuck it back into the soil. Just remember to keep it in a nice light space so they get enough sun. 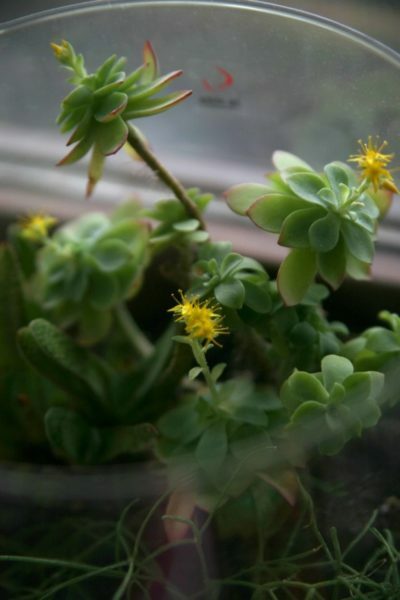 You hardly ever need to water it since succulents hardly need any water. All you have to do is pick out the dying or wilting leaves so it keeps looking nice and clean and to maintain the health of the little eco system. If a whole plant dies, take it out as well. You can also add all kinds of little decorations. For example if you give it too a superhero fan add a plastic figure of his favorite character. The overall costs are around 15$ depending on where you get your supplies from. You can find gorgeous vases in thrift stores like Goodwill for a couple of bucks. Und hier nochmal in Deutsch. Ich wollte schon immer mal ein Terrarium machen. Der Hype darum ist ja schon lange im Netz und jetzt zu Weihnachten dachte ich mir es wird Zeit es mal auszuprobieren. Und es ist ja auch nebenbei eine ganz schöne Geschenkidee. Stelle dir vor wie du die Planzen arrangieren möchtest. Stelle sie probeweise mal in die Vase um deine gewünschte Anordnung zu finden. Die Pflanzen dürfen nicht zu nah am Rand sein, da sie sonst nicht genug Platz zum wachsen habe. Zuerst muss der Boden mit den Tonstücken befüllt werden bis man den Grund nicht mehr sehen kann. Falls versehentlich später mal zu viel gegossen wurde nehmen die Tonkugeln das überschüssige Wasser auf, sodass die Planzen nicht ertrinken. Jetzt werden die Pflanzen so eingesetzt wie man sich das in Schritt 1 überlegt hat. Sobald man mit den Pflanzen zufrieden ist füllt man mit der Kakteenerde auf bis die Wurzeln bedeckt sind. Wenn etwas auf den Pflanzen landet einfach runterbürsten z.B. mit einem Pinsel. Und schon ist es fertig! Schleife drum und unter den Baum gestellt. Mach bestimmt einen tollen Eindruck! Das ganze kostet ca. 20 Euro und somit auch echt preiswert. Mein Terrarium hat sogar nach einer Woche angefangen zu blühen! Hab wohl einen grünen Daumen *lach* Viel Spaß beim nachbasteln! This is a beautiful terrarium! I featured it on my blog: http://www.jadeandfern.com. Great idea and coming soon again. Cute terrarium. What is the bright green stringy succulent in the front? Thank you Erin, unfortunately I have no idea. I bought those succulents on a flea market without a label. Thank you I always admired these plants.